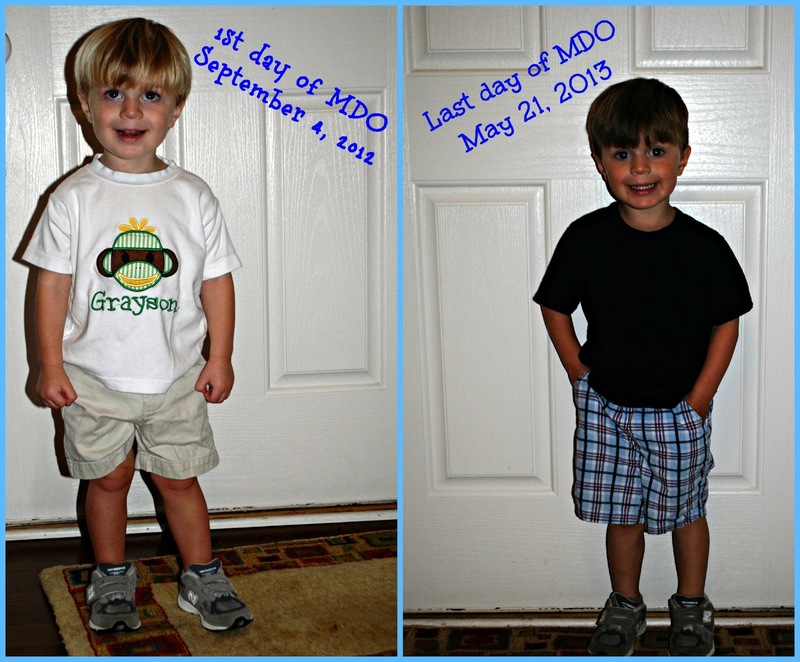 Moments with the Mays: End of the School Year! We enrolled Grayson in the 2 year old preschool class at our church before Griffin was born. I knew he would need some interaction with other kids and time away from his mama & new baby brother. I knew that he would enjoy it, but I never realized just how much he would learn & grow! This was Grayson on his first day of school in the fall. I can hardly believe it. He looks like such a baby! We were so blessed to have Grayson's awesome Sunday School teacher, Ms. Barbara, along with Ms. Jennifer, as his teachers this year. It was so nice having the same teacher at school and at church! Grayson talked about his teachers all the time & I know that he adores them. Ms. Jennifer & Ms. Barbara loved on our boy all year & I'm so thankful for that! On the second to last day of school there was a program. Grayson's class sang 2 songs with their music teacher, Ms. Emily. They had the stage set up like the music class & it was so fun to watch them interact with their music teacher and each other. G had fun singing & using the handkerchiefs and rhythm sticks! LOOK AT THAT DIFFERENCE. I'll be honest (and totally shallow), I MISS HIS BLONDE HAIR. Good grief. He turned into a brunette! G looked like such a baby to me in September & looks like such a big kid now. Grayson had such a great school year & we will miss his teachers so much. This year flew by! Tomorrow is Owen's last day! They are also having a little program-I'm taking my tissues with me! ;) Owen's hair was very blond and is now darkening too...These boys are growing up so fast! !